A Conservation Restriction (CR) adjacent to Broadmoor Wildlife Sanctuary was expanded to permanently protect an additional five acres. The donation was made by the Hunnewell family and it preserves a section of Glen Street in Natick from further development. It also helps ensure the integrity of this natural corridor along the Charles River. The expansion of this CR is another gift in a remarkable set of 5 separate donations from the Hunnewell Family to Mass Audubon dating back to the 1970’s. The total amount of land they have protected with Mass Audubon is now roughly 137 acres—an impressive achievement from a conservation-minded family. The story of the Hunnewell family is not entirely unusual; although, the number of donations does demonstrate a particularly remarkable generosity. Many people decide to preserve their land gradually over a period of time. The reasons for this are numerous. Some families reserve a small portion of their land to sell as a house lot in case they find themselves in financial need later. Then, in the future, they may realize that they do not need this financial insurance so they choose to conserve the rest of it. Others choose to conserve part of their land during their lives, and then gift the remaining interest upon their passing. With a bit of thoughtful flexibility, we can preserve more land than otherwise possible. If you are thinking about conserving your land, remember that land conservation is not always an “all or nothing” proposition. You can make some arrangements to protect your land now, and then build on that in the future if you like. This entry was posted in Conservation Restrictions and tagged Broadmoor Wildlife Sanctuary, donation on January 14, 2019 by Land Conservation. Posted on November 29, 2016 by Bob W.
In Land Conservation, protecting a piece of land is often just the first step. 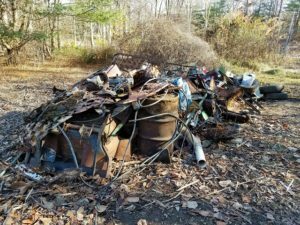 On the Saturday before Thanksgiving, well over 30 volunteers came out to help clean-up old debris and trash on the Handy Street Conservation area in Attleboro, MA. 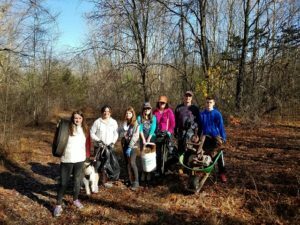 The Attleboro Conservation Commission ran the event in a collaborative effort with the Mass Audubon and the Attleboro Land Trust. cooperation with Mass Audubon, the Attleboro Land Trust, and the City of Attleboro. The land is owned by the City of Attleboro, but directly connects to Mass Audubon’s Attleboro Springs Wildlife Sanctuary. 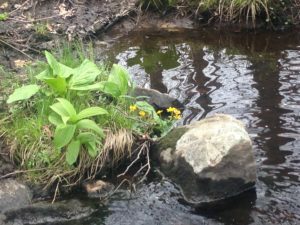 Less than two miles from Downtown Attleboro, this ecologically rich property with winding streams and numerous wetlands serves as vital habitat, particularly for amphibians. The City of Attleboro is a hotspot for vernal pools, which are important breeding grounds for frogs and salamanders. However, the land also suffers from an overabundance of dumped garbage, trails, and other issues. Last Saturday though, our hard working volunteers lugged many pounds of scrap metal, tires, and other refuse out of the woods. For a couple hours, the property buzzed with activity. Nearly all of us felt a general sense of accomplishment by the end of the day. Their help has made a huge difference, and is a great first step towards restoring this property to pristine condition. This entry was posted in Conservation Restrictions on November 29, 2016 by Bob W..
A Whole Lot of Land Protection Goin’ On! As we say here in the Bay State, it has been a “wicked busy” spring and summer! Following a relatively quiet period at the beginning of the year, a number of important projects recently came to fruition during a flurry (can we use that word in this weather?) of activity as the warm weather set it. 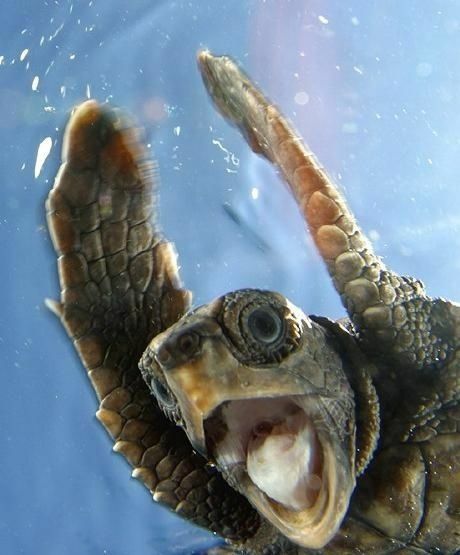 Now that the dust has settled a bit, it is fun to share all of the good news. 350+ acres in Spencer (Sibley Farm) were protected in perpetuity, along with 50 acres at our Rutland Brook Wildlife Sanctuary in Barre (Patterson), 100 acres in Wendell, Orange and New Salem (Fisk) at our Whetstone Wood Wildlife Sanctuary, and 9 acres in Barnstable Village (Ferguson) at our Barnstable Great Marsh Wildlife Sanctuary. 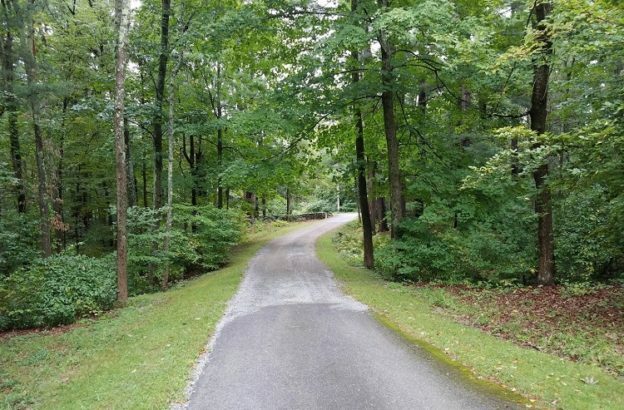 During this whirlwind of activity, we also celebrated a Conservation Assist – helping to achieve an important outcome by the Town of Ashland, in which they successfully protected the 120 acre Warren Woods property in that community. And, if that’s not enough, we also succeeded in obtaining the final $800,000 in grant funds from NOAA to deliver the final payments to the Sacred Hearts Healing Center, wrapping up the very successful Great Neck Conservation Initiative in Wareham. These projects succeeded by working in partnership with our valued public and private conservation partners, and through the invaluable support of people like you. Wicked good job! This entry was posted in Acquisitions, Conservation Restrictions, Great Marsh Conservation Initiative, Partners, Project Updates, Sibley Farm, Warren Woods, Wildlands on July 27, 2012 by Land Conservation. As the year of monitoring winds down and we frantically try to complete all our visits by year’s end, occasionally I’m caught totally off guard by the unexpected. And this year was no exception. Being one who puts off the best for last, monitoring that is, I saved my visit to Gosnold until now. Gosnold is a small town located on Cuttyhunk Island, at the end of the Elisabeth Islands, off the tail of Cape Cod. The island has less than 20 permanent residences and a school age population that currently stands at two—brother and sister ages 8 & 6. Mail comes twice a week along with general supplies to the island, depending on the weather. Winters tend to be very long, cold, and a bit windy (to say the least). In the summer months (July & August) the population quadruples with summer residents and that doesn’t count the many pleasure boats that visit, passing through on their way to the Cape & Islands. Well, yesterday my belief was restored. Shortly after the ferry docked on Cuttyhunk, I was finishing a hot cup of coffee with the Captain & crew (after all it was quite cold, and none of us wanted to leave the warmth of the ship’s galley), when all of a sudden there was quite a clatter on the upper deck! We all jumped with wild expectations of what could possibly be going on. We rushed on deck thinking the ship was headed down! And who, to our surprise, was standing there on a pre-Christmas visit to the children of the Island?…. Old Saint Nick! Photo of Santa making a special trip to see the Lynch Family on Cuttyhunk Island! This entry was posted in Conservation Restrictions and tagged Cuttyhunk, Gosnold on December 21, 2011 by Land Conservation. Our project in Norfolk has brought 7 additional acres to Stony Brook Wildlife Sanctuary. The land was given to us by the developer of an adjacent parcel, who was motivated by the Planning Board and their new Open Space Subdivision rules. The newly protected land is upland pine-oak woods which partly surround Bristol Pond. The Valencia project was a gift of 0.70 acres of wetlands mostly surrounded by Broad Meadow Brook Wildlife Sanctuary. The parcel was created when a house was built on an adjacent lot, and this piece was left over as a remnant. The little parcel of land fits beautifully into our sanctuary, and we’re very grateful that it’s former owner donated it to become permanently protected habitat. Lastly, the Almy project is a new 5.7-acre conservation restriction adjacent to Allens Pond Wildlife Sanctuary. The protected land consists of upland pasture that was identified as a priority for protection by Mass Audubon in our sanctuary protection plan and consists of both high quality habitat and a scenic landscape. This entry was posted in Acquisitions, Almy Property, Conservation Restrictions, Valencia Property and tagged Dartmouth, Norfolk, Worcester on August 4, 2011 by Land Conservation. Recently on a beautifully clear and sunny day, two intrepid stewardship staff members (John Coolidge, CR Stewardship Specialist, and I) crossed the waters of Spy Pond in Arlington to reach the shore of one of Mass Audubon’s newest CRs, Elizabeth Island. The 1 ¾ acre island is owned by Arlington Land Trust, and Mass Audubon co-holds the CR with the Town of Arlington (check out our previous blog post on this project). With the sun at our backs we ventured out to the island with the help of a canoe borrowed from a local friend of Mass Audubon and the Arlington Land Trust. We gathered baseline documentation (photos, GPS locations of trails and landing areas, etc.) by water and land to help inform future monitoring of the island. We were delighted to see that the island is undoubtedly well-loved by the public, with no recent evidence of trash or other abuses found. It really is no surprise that this lovely oasis of natural habit is a beloved landmark in Arlington—and we’re very proud to help protect it! John Coolidge, CR Stewardship Specialist, taking in the property conditions (and the sunshine). Taken from the canoe; the same view of the island as you see from Concord Turnpike. This entry was posted in Conservation Restrictions, Elizabeth Island, Partners and tagged Arlington, Elizabeth Island, Spy Pond on May 18, 2011 by Land Conservation. Western Mass Electric Company. On Monday evening the Agawam City Council voted unanimously to approve these two conservation restrictions, totaling 65 acres at two sites, following Conservation Commission approval in late March. Western Mass. Electric is working to wrap up a few final permitting issues with the Corps of Engineers and the state’s Natural Heritage and Endangered Species Program, with hopes of completing the process and conveying the conservation restrictions this summer and initiating construction in the fall. Our crew heads out next Wednesday to gather baseline documentation (pictures, GPS locations of boundary points, etc.) that will help our stewardship staff monitor the property going forward. Almy Property. This 5.7-acre conservation restriction nestled against Allens Pond Wildlife Sanctuary in Dartmouth and other protected land will be placed on record any day now. The CR has been approved by the Dartmouth Select Board and by the state’s Secretary of Energy and Environmental Affairs, and is awaiting the blessing of the Dartmouth Planning Board as part of the Board’s approval of the family’s 3-lot Open Space Residential Design subdivision. Valencia Property. The gift of this 2/3-acre bit of wetland surrounded on three sides by our Broad Meadow Brook Wildlife Sanctuary in Worcester is a couple of steps closer to completion. Earlier this month I walked the property with Deb Cary and Martha Gach from the sanctuary staff as part of our routine evaluation of any contamination risk from oil or hazardous waste. The property passed with flying colors and we had a nice conversation with one of our prospective neighbors to boot. A draft purchase-and-sale agreement is circulating. Above: Mass Audubon staff Deb Cary and Martha Gach on the proposed Valencia gift. This entry was posted in Acquisitions, Almy Property, Conservation Restrictions, Project Updates, Valencia Property, Western Mass Electric Company and tagged Allens Pond Widlife Sanctuary, Almy, Broad Meadow Brook Wildlife Sanctuary, Dartmouth, Valencia, Western Mass Electric Company, Worcester on April 22, 2011 by Land Conservation. Fast on the heels of the protection of 72 acres in Sharon through our partnership with the town and Massapoag Sportsmen’s Club, Mass Audubon is working with the town of Sharon again – this time, to place a conservation restriction (CR) on an additional 10 acres. The CR will insure the permanent protection of an area of woodlands and wetlands adjacent to the 72 acres protected two months ago. Conservation of the land will further contribute to the protection of Massapoag Brook, which borders the property, and create an extension to a town-wide hiking trail known as the Massapoag Trail. This entry was posted in Conservation Restrictions, Partners, Project Updates and tagged Massapoag Sportsmen's Club, Sharon, wetlands, woodlands on March 3, 2011 by Land Conservation. Western Massachusetts Electric Company (WMECO) has proposed upgrades to their transmission lines running from Connecticut through Agawam and Chicopee to Ludlow. Work associated with the upgrade will result in some impacts on wetlands and rare species habitat along the route, requiring that the company obtain permits from the U.S. Army Corps of Engineers and the Mass. Natural Heritage and Endangered Species Program. Those two agencies, seeking to mitigate the impacts that cannot be avoided altogether, are requiring WMECO to permanently protect wetlands and rare species habitat in two locations in the town of Agawam just west of Springfield. Why are we telling you this? WMECO has asked Mass Audubon to hold the conservation restrictions that will permanently protect these areas, a total of about 65 acres. The properties are highly deserving of protection, with multiple designations related to ecological value and rare species. We have had several bargaining sessions, hammering out language that will ensure meaningful protection for the land while allowing WMECO to use it for electrical transmission. We are closing in on our goal, and if all goes well, the conservation restrictions will go to record sometime this spring. This entry was posted in Conservation Restrictions, Partners, Project Updates, Western Mass Electric Company and tagged Agawam, Chicopee, conservation restriction, Ludlow, transmission lines, WMECO on February 15, 2011 by Land Conservation. In New Salem, Mass Audubon is working with landowners to permanently conserve 98 acres at Whetstone Wood Wildlife Sanctuary, the only Mass Audubon sanctuary managed as a wildland. These 98 acres are high priority for conservation—the chance to protect a sizeable tract of forest adjoining the sanctuary and significantly expanding a protected wildland is a rare opportunity in Massachusetts. Conservation of this land will enlarge a substantial stretch of undisturbed habitat for interior forest species like moose and bobcat. The property’s northern and western boundaries are shared with our existing sanctuary. Expanding Whetstone Wood through this acquisition helps build the bridge between the two largest areas of protected land in the state— the Quabbin Reservoir and its surrounding watershed to the south, and the nearly 80,000 acres of land protected by private land trusts and by the state in Wendell, Orange, Erving, Warwick, Northfield, and Mt. Grace State Forests located nearby and to the north. If it weren’t for the conservation-mindset of the landowners, this fantastic opportunity would not be turning into reality. They have generously agreed to a bargain sale to Mass Audubon for 70 acres outright plus a conservation restriction on 28 acres containing the home and farmstead, which they will retain. The conservation restriction on the farmstead will be structured to accommodate the landowner’s needs, while protecting designated areas as wildland. We're hoping to close on this project within the next few months! This entry was posted in Acquisitions, Conservation Restrictions, Project Updates and tagged New Salem, Quabbin Reservoir, Whetstone Wood on January 21, 2011 by Land Conservation. Donate to the Mass Audubon Land Conservation Fund.